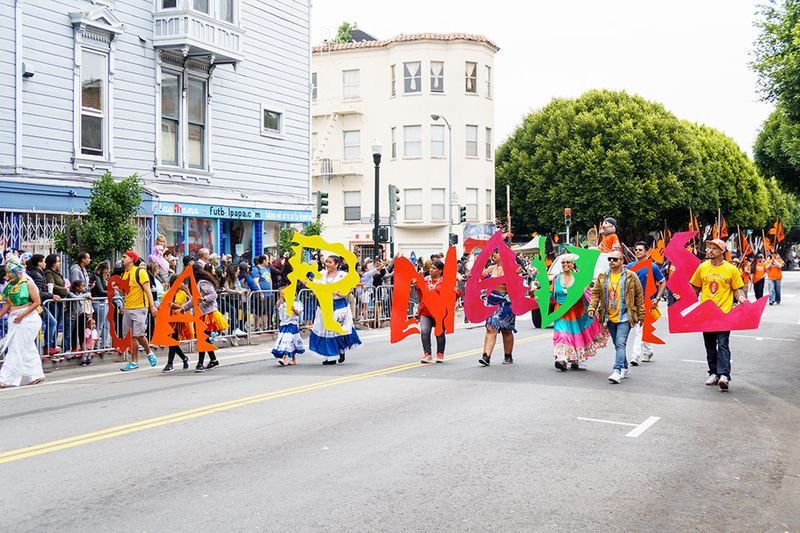 On Memorial Day weekend, art, dance and musical traditions from Latin America, the Caribbean and the United States will converge in the Mission at the 40th annual Carnaval celebration. The festival will be held from May 26 - 27 on Harrison Street between 16th and 24th streets. A grand parade featuring floats with multicultural themes and performers will take place on May 27, starting at 9:30 a.m. This year, the festival pays homage to people who have helped cultivate the Bay Area's multicultural community over the years. 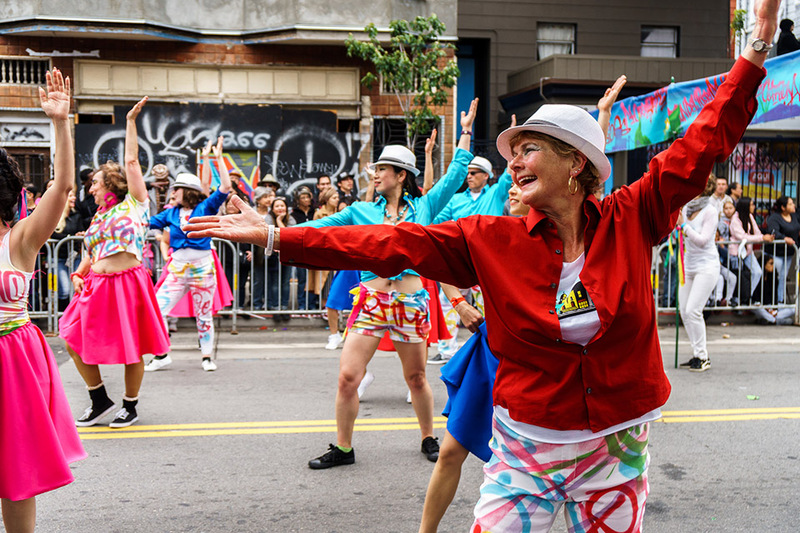 "Many revelers from throughout the Bay Area grew up dancing in the parade and are now seeing their children and grandchildren do the same," wrote organizers. Vehicles still parked in the festival zone are expected to be towed starting on Friday at 7:00 p.m., but most streets will reopen on May 28 at 2 a.m. SFMTA has posted a list of all street closures. Sunday's parade will begin at 9:30 a.m. at 24th and Bryant streets, proceed down 24th St. to Mission Street, then turn north towards 17th St. and South Van Ness Ave.
Fifth St. (between Mission and Alabama), 24th St. (between York and Mission), Bryant St. (between 17th St and Cesar Chavez), Harrison (between 15th and 16th), Mission (between 15th and 24th) and Treat (between Harrison and Alameda) will be closed to vehicle traffic during the parade. 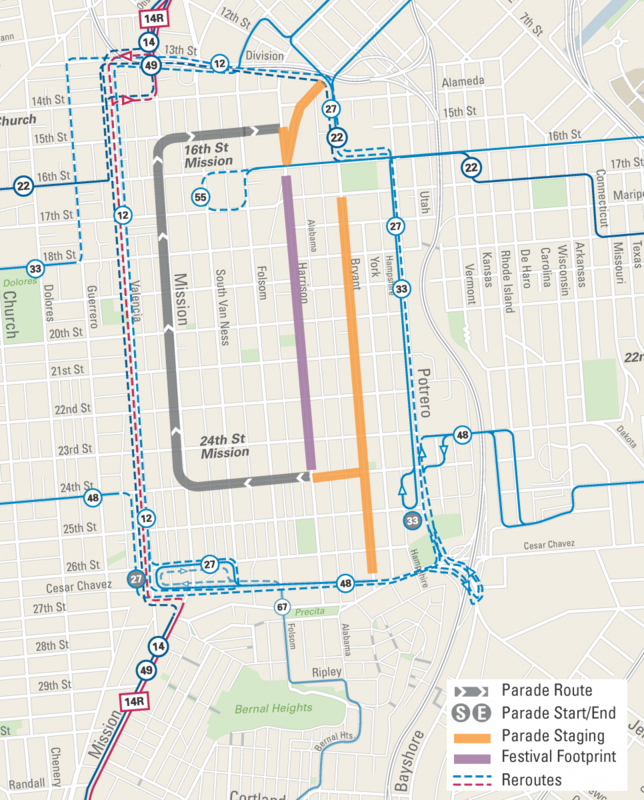 SFMTA also announced that bus lines 12, 14/14R, 27, 33, 48, 49, 55 and 67 will see reroutes on Sunday, while the 9 and 22 may see increased ridership and delays. All routes will return to normal service after the streets are cleared at approximately 4 p.m.
Several animal welfare organizations housed in the area will also be affected by the festival. "On Sunday - parade day - we're closed, but still offering limited services -- drop off of stray animals; lost pet searches; lost pet redemptions and dog licenses," Animal Care & Control (1200 15th St.) spokesperson Deb Campbell told us. SFSPCA (250 Florida St.), on the other hand, isn't changing its hours. "We'd love for people to stop in and visit if they'll be in the Mission," spokesperson Krista Maloney told Hoodline. "We are not hosting our traditional open house events because Carnaval makes it difficult for clients to get to us, but we will be open by appointment," said Bunny Rosenberg of senior dog rescue Muttville. "With all of the noise and people traffic from the parade we try to get as many dogs as possible into foster homes to minimize their stress," she added. The emergency services of San Francisco Veterinary Specialists (VCA) at 600 Alabama St. won't be available for the weekend as well. The pet hospital announced to their clients that it will be closed from May 25 at 6 p.m. through May 28 at 8 a.m.
"If you have an emergency with your pet, please contact your primary care veterinarian," they wrote, adding that another available emergency hospital is SPCA's Pacific Heights Campus.